I’ve been drinking craft beer for over a decade. In that time there’s been a ton of change in the industry. One thing that has remained constant, the best breweries always have the trendiest beer. When asked to rate the best breweries out there (craft beer drinkers own ratings rather than those of other brewers or industry experts), it’s clear that the current beer trends hold huge weight in their response. The answer you’ll get from most is that the best breweries are also those making whatever the current trend in craft beer is. When IPAs were the big thing, those brewing West-coast hop bombs were consistently the breweries people rated the highest. There may have been a couple Midwest and East-coast brewers thrown in there, but it was always those brewing hop-forward beers. Imperial stouts became the hip new thing and so did any brewery known for making them. The bigger the beer, the more likely someone was to name them one of the best breweries out there. Barrel-aging was the next trend in craft beer and with it, the brewers making them were named to the list of the best by the general drinker. As sours and NE-style IPAs have grown to be the current hype-styles, we see the same accolades on any brewery offering them. 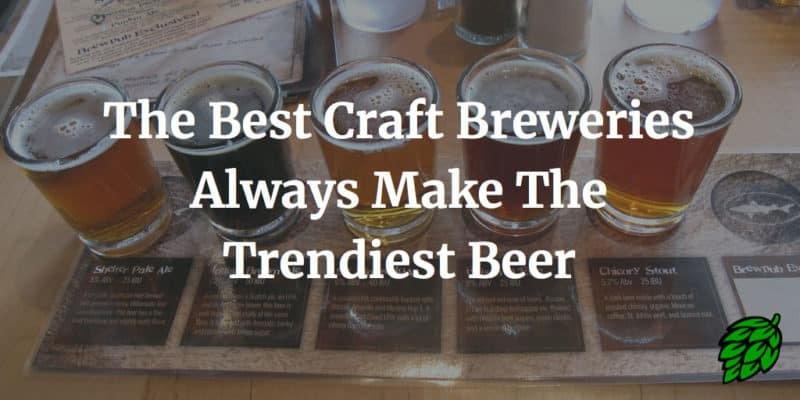 While it makes sense that people pay attention to those offering the currently trendy styles, it’s interesting to see that range of offerings, quality/consistency, and other factors play little role in how the general craft beer drinker rates the best breweries. It doesn’t matter if a brewer has produces a wide range of well established and award winning beers, if they aren’t offering the current in thing, they’re not considered the best. Distribution doesn’t seem to matter much either. A brewery that only sells product from their taproom is actually more likely to be named a best brewery, due to the limited availability of their beers. Rarely will a national brand ever be seen as one of the best. It’s hard to be hyped when you’re readily available. It’s also interesting to see how quickly things change as consumer tastes move on to the next big thing. A brewery may be the talk of the town one day, only to be largely forgotten months later as the next new style emerges. The loyalty craft beer fans show can be quickly forgotten, as the crew goes chasing the new hype. As with everything in the beer industry, change is a constant. What’s trendy today isn’t tomorrow. New styles appear and then we move on to the next. There’s nothing wrong with liking the hot new thing or brewery making it. But I’d consider if a brewery is truly the best for making a single beer or even a few. Does being the hot thing today really make you the very best? A rookie just drafted to the pros is now better than Michael Jordan with a career of accomplishments? That I’m not so sure about. Excellent point. It’s interesting that as “independent” as breweries try to be, they seem to be afraid of missing out on a trend. Everyone will be complaining about pumpkin soon (for example) but breweries with a name feel like they have to put their stamp on it. I get why. As a brewer you don’t want people to be bored with the same lineup all the time, but you’re right in that participating in trends doesn’t make a brewery better or worse all on its own.